This is one of my mom's recipes. When I was a kid, she only brought these out for extra special occasions, like my sister's wedding. So I never wanted to try making them because I figured they must be soooooo difficult to make. In my mind, I lumped them into the same category as French macarons (which I will try soon thanks to the awesome little cookbook I got for Christmas). What I learned recently is that these fancy little Cream Wafers feel really special and look pretty and sparkly, but they are actually quite easy to make. The cookie is light and delicate with a shimmery layer of sugar. The filling is smooth, sweet, and decadent. Make these for your next special dessert - everyone will love them. In a large bowl, thoroughly mix together the butter, cream, and flour using an electric mixer. Divide the dough into two equal parts. Wrap each section of dough with plastic wrap and refrigerate for 1 to 2 hours. After the dough has chilled, heat your oven to 375 degrees. On a well-floured surface, roll one section of the dough to about 1/8 inch thickness. 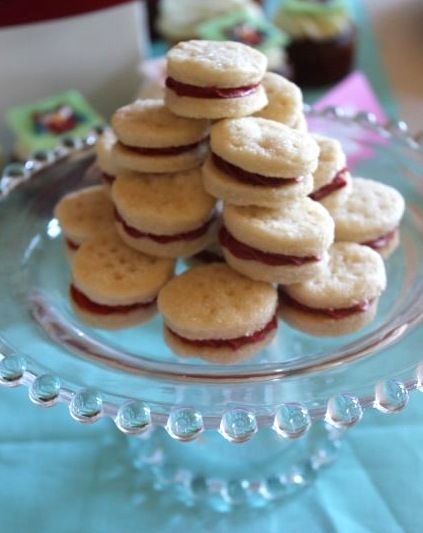 Use a small round cookie cutter to cut 1 1/2 inch rounds. HINT: I actually used a shot glass to cut mine. It's the perfect little size. You could also use a small heart, square, or any small cookie cutter shape you like. Be sure to cut an even number of shapes because you'll be matching them up to create little sandwiches. Transfer the dough rounds carefully to a flat bowl filled with the 1/2 cup granulated sugar. Coat both sides of each round with the sugar. Place the dough rounds onto an ungreased baking sheet. Prick rounds with a fork about 3 or 4 times. Bake the cookies for 7 to 9 minutes or until just set, but not brown. Cool cookies completely and match cookies into pairs. Cream together the butter, powdered sugar, and vanilla until smooth and fluffy. Tint with a few drops of food coloring if desired. Use water 1/2 teaspoon at a time to thin the frosting if necessary. 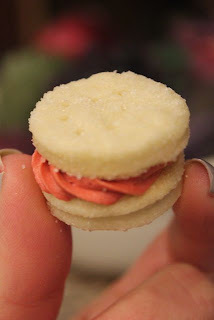 Using a pastry bag or simply a small spatula, spread about 3/4 teaspoon of filling onto a cookie. Top it with a matching cookie to form a sandwich. Display on a pretty plate. Enjoy!